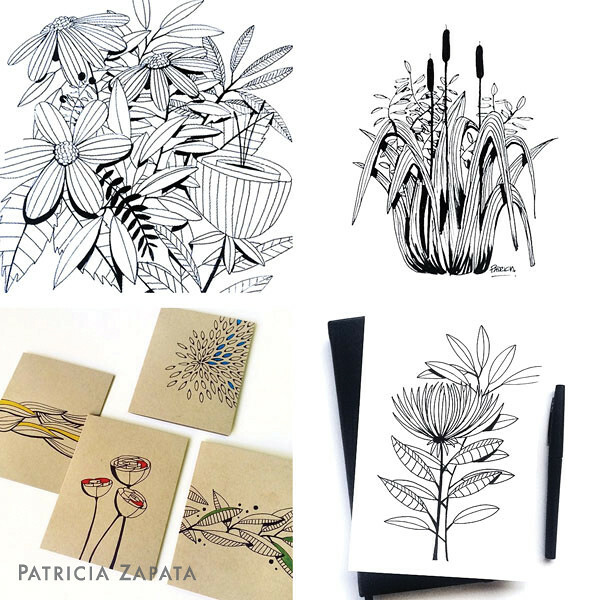 These are just a few examples of ink illustrations that I've been posting on my Instagram feed. It's a direction that I've been headed towards for a long time. Until recently I hadn't really considered this something I wanted to pursue more seriously. But I can't seem to stop. Whenever I pick up my pen it just appears on the paper. None of these drawings are preplanned. I just start. Always in ink and no pencil. My work has tended to be more graphic and clean, so adopting this loser style is something that has taken time to get used to. As I've grown more comfortable with it, I've had several friends tell me that I need to illustrate a coloring book. So, that's where this is all headed. I consider these the warm-ups and the illustrations for the book will be inspired by everything I've done so far. I have several projects ready for another paper craft book but somehow they weren't coming together the way I expected. This new project on the other hand is something I can see completed in my mind — something that always happens to me when a project is really the path I should follow —I'm following my heart. Like many of you, coloring was my first introduction into art and paper and I LOVED it. I could color for ever when I was little. This makes this project feel like I'm coming full circle. Pretty cool. So, there you have it. A coloring book is coming. Yes! Have a great weekend everyone! I'm off to a church retreat today and will be back on Sunday. I think the time away from everything will be awesome.